Thank you for making a pledge to Cook alFreshCo; Support a Biking Culture. We will notify you by email when the fundraiser is launched! 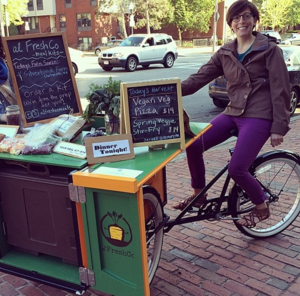 Cook a vegetable-centric, locally sourced meal, fast, all while supporting low-impact, healthy transport via bikes and trikes! to endorse Laurel Valchuis's fundraiser for Boston Cyclists Union. At al FreshCo we are innovating on how people access fresh food in a low-impact way. We make meal kits made with locally sourced food from great farmers, and sell the kits off our tricycle around Boston, or deliver the kits via bicycle to your door. We are immensely grateful to the great work of the Boston Cyclists Union, who works hard to advocate for the growth of a safe and efficient biking system in Boston, and we want to see more! We're offering a discount on our meal kits in exchange for a donation to the BCU to get more people peddling the streets of Boston, and to help us peddle kits right to you. Endorse Laurel Valchuis's fundraiser for Boston Cyclists Union. Log In or Create An Account to endorse Laurel Valchuis's fundraiser for Boston Cyclists Union. Pledge to "Cook alFreshCo; Support a Biking Culture"
Donate to "Cook alFreshCo; Support a Biking Culture"